Many ask me to keep for Shern. Well, I did. I kept some colourful ones for Shern. 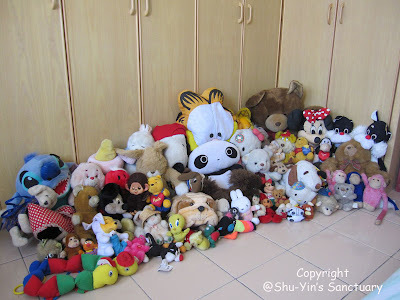 But I think Shern has enough soft toys. And it gives me excuse to buy new ones in the future. I hope these will bring a smile to those children receiving it. I know they will be going to good homes - to the hands of the children who loves them and bring them to bed with them. Rather than with us stuffed inside plastic bags into the top of the wardrobe. the ones me and my 2 sisters have are still around. Most of them are in the cupboard, some are in a place called the green apartment and others are on my bed. i wouldn't be able to give them away!!! i think it's coz i secretly believe they are alive. hahaha. 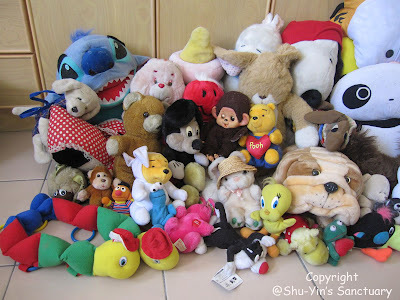 Shu Yin... wah I just realized that you have got so many soft toys... when you want to give me some to accompant my Patricks? chiaoju...no place to keep them ler. n i think other kids will benefit from it more than us. 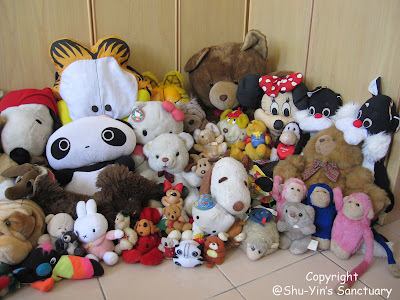 yf...im sure ur patrick got many companions dee la..no need my soft toys.